Westside Theatre Reviews: LOoPY Pirates Aboard! Laurence Cox, Ron Swingen, Lindsey Lefler, and Jacob Mott. 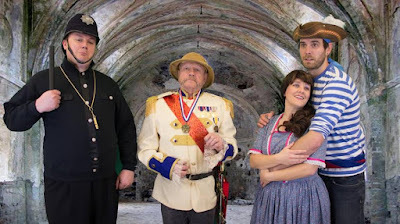 Light Opera of Portland (LOoP) is bringing yet another Gilbert and Sullivan classic, The Pirates of Penzance, to Southwest Portland, and the timing could not be better. Director Dennis Britten is a purist, and has resisted the urge to modernize the telling or the tale for contemporary audiences – but this production proves that Gilbert & Sullivan’s witty work has survived quite nicely, thank you. The 138 years since it first played on a New York stage may have brought mind-boggling changes in society, but Western culture’s fundamental foibles are still vulnerable to the same sly parody that the show’s authors wrought so many years ago. Like all good G&S work, the core story is utterly absurd. Young Frederic (mistakenly apprenticed to a band of pirates until his 21st birthday) is coming of age, and is eager to resign from piracy and pursue a more conventional life, including the acquisition of an appropriate wife. His nursemaid Ruth, now way over the hill (Hey! When did 47 become old? ), tries to convince him that she would be a great choice; Frederic’s skepticism is validated when a bevy of younger women (wards of Major-General Stanley) appear on the beach. Frederic instantly falls for the lovely Mabel, who reciprocates his ardor without hesitation. The pirates attack and undertake to forcefully wed all of the fair damsels, but the Major-General plays on the pirates’ sympathy for orphans to talk them out of it. Frederic recruits a local police force to round up the pirates, and prepares for wedded bliss. Alas – as the wedding plans are afoot, it is discovered that Frederic was born on February 29th, a leap year, and that his 21st birthday will not come around until 1930 – until then he must remain a pirate. Mabel swears to wait for him. After a loud, blusteringly bloodless battle between the tender hearted pirates and the cowardly police, everything gets sorted out nicely – Gilbert and Sullivan’s stories may not make literal sense, but they definitely leave no unresolved plotlines. Light opera demands a powerful and precise vocal ensemble, and Musical Director Linda Smith has brought out the best in a large (29 actors), experienced, and proficient cast, many of them veterans of previous LoOP productions. The six principal cast members (Jason Weed as the Pirate King, Phyllis Fort as Ruth, Jacob Mott as Frederic, Lindsey Lefler as Mabel, Ron Swingen as the Major-General, and Laurence Cox as the Sergeant of Police) carry a lot of the show, but they are well-supported by the rest of the cast and the superb little orchestra (Amanda Lyons’ flute work is especially evocative). Each group (pirates, policemen, and wards) forms a separate vocal ensemble for many of the songs, but they integrate beautifully together for the largest production numbers. Among the principals, Lefler (as always) stands out in her ability to wander around looking wide-eyed and innocent while delivering a flawless coloratura soprano performance. Her counterpart, LOoP newcomer Mott, is that rare trained tenor who can really act, not to mention being more than easy on the eyes. Weed is superbly cast as The Pirate King – his huge physical presence is mirrored by his huge bass baritone delivery, and the beard alone would sell the character. Fort is hilarious as an over-the-hill wanna-be ingénue playing at being coy and winsome, and Swingen manages to recite his tongue-twisting lines just the right touch of dithering, effete pomposity. Finally, Cox is terribly fun to watch as he vacillates between false bravado and temerity, and he delivers strong lead vocals plus a solid foundation for his team’s ensemble numbers. The stage at the Multnomah Arts Complex is large enough to accommodate the cast nicely, even when they are all performing at the same time. The large, cartoon-like props help by providing hiding places for various cohorts throughout the show, and they help to set a lighthearted tone for the production. Costumes are remarkably authentic – the program indicates that, as with the set, it took a village to gather up the right stuff. Once Pirates closes, you won’t have the opportunity to experience the utterly absurd yet aesthetically spine-tingling magic of LoOP’s performers until late September, so treat yourselves to the fun of light opera while you can! Light Opera of Portland’s Pirates of Penzance plays at the Multnomah Arts Center, 7688 SW Capitol Highway, Portland through Sunday, March 5th, with performances Friday and Saturday at 7:00 pm and Sunday at 3 pm.